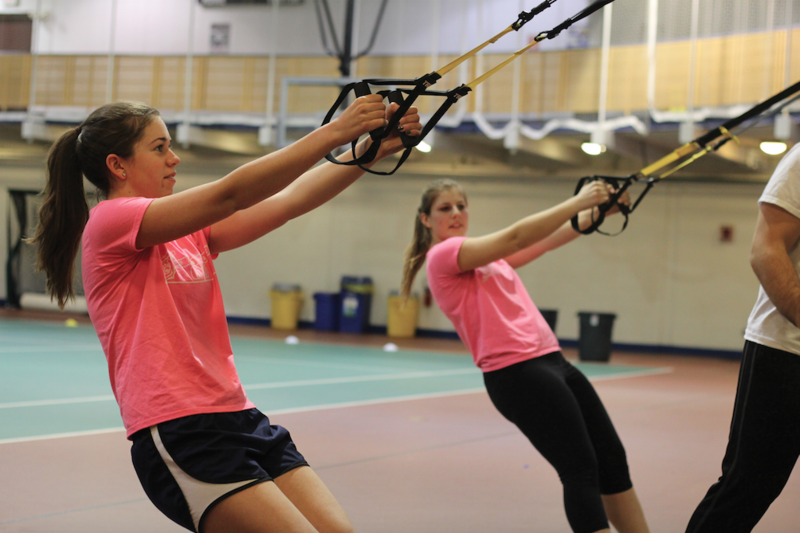 The Quinnipiac women’s golf team shuffled into the gym at 8 a.m. for practice. It was a typical New England, January morning. The air was bitter, and the ground was snowy, so they traded traded green fairways for the green Rec Center floor. Though some of the golfers joked they would rather be sleeping, they were all there and ready to practice. The golf team’s willingness to practice daily and work hard is a big part of what they pride themselves in. The coaches, trainers and athletes all say the same thing: they work as hard and often as possible, whether a golf course is available to them or not. Before the golfers began their shuttle run testing, Moore pulled a trash can over to the starting line. “This is in case they throw up,” he said. 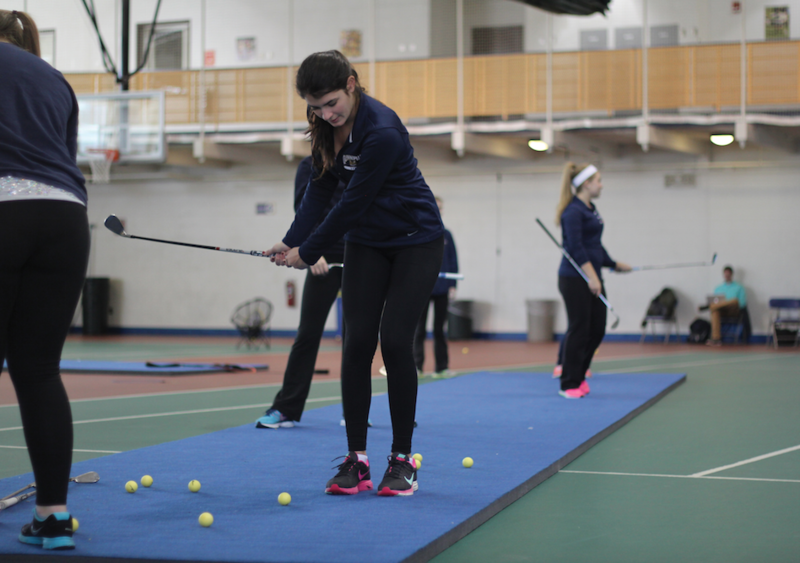 The golf team operates on a six-day week. They spend Mondays, Tuesdays, and Thursdays with Moore. On Mondays and Tuesdays they hit the weight room, and on Thursdays they are conditioning on the gym court. When they aren’t with Moore, they take a yoga class and spin class on Wednesday and Friday respectively, and on Saturday they are strictly with their fifth year head coach John O’Connor. He sets up mats, nets and baskets in the gym, so they can work on their chipping, pitching and putting. O’Connor also has his team do a lot of non-physical work. He brings in a sports psychologist to help teach his golfers how to step back, focus on each shot, and to stay calm no matter what the conditions are. He also brings in a rules official for up to 10 hours each winter to keep himself and his team up-to-date on rules. O’Connor and Moore have found a balanced ground where they can work individually, and together, to benefit the team in as many ways as possible. They understand each other’s roles within the team, and they know how to help each other. Whatever O’Connor relays to Moore, he takes those words and turns them into an entire workout plan for the team. 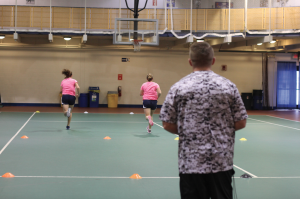 Moore says his job entails more than just preparing these athletes for the spring season. 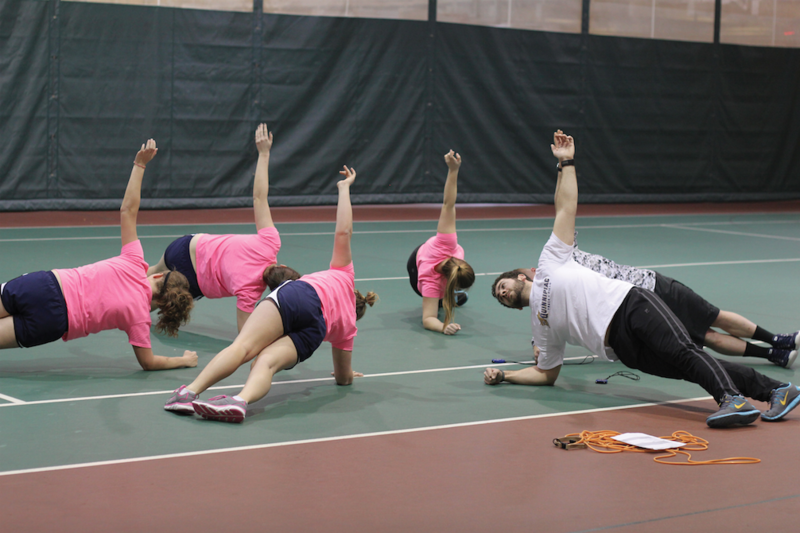 Part of his job is to heal any lasting injuries that they have from the fall season, such as back and wrist injuries. A lot of the players talked to Moore in the fall about their wrists and backs hurting. But since he only sees them one day a week in the fall and spring seasons, there was not much he could do. Since then, Moore came up with a way to get around the dilemma of not being with the team in season. He created a couple exercises that his athletes can use whether they are with him or not, such as stretching with elastic bands, and using rice buckets. Rice buckets are exactly what the name says: big buckets filled to the brim with rice. The golfers just stick their arms in the buckets and move the rice around with their hands. It irons out the aches and pains in the wrists, as well as increasing both durability and flexibility. Both Moore and O’Connor are stressing the importance of durability this winter, and a lot of that comes in the weight room. They devised a weightlifting program that mimics a golf swing. The goal of their winter weight training is to match the energy systems of a golf swing with weightlifting, which means that he wants his golfers to lift more weight with more force, as opposed to less weight and more repetitions. These women know how to work hard, and they love what they do. But they also know how to have fun. That day, O’Connor turned on “The Wobble” and jokingly offered the team Chipotle if they danced to the whole song. Ribbins and junior captain Jenn Whaley both said their coach is what makes this team special. They said that they work so well together because he cares so much about them as a team and individuals. Whaley has a strong understanding of what O’Connor is looking for, and vice versa. Because of this, they have competitions during practice, which is a happy medium for both. O’Connor makes sure his golfers are still practicing and focusing on their game, but he also makes it so that they can still have fun.